Browsing articles from "October, 2014"
Comments Off on Van Gough’s severed ear regrown with help of 3D Printer! 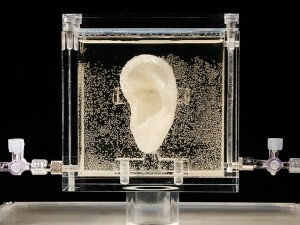 Van Gough’s severed ear regrown with help of 3D Printer! The rise of 3D Printing has undoubtedly led to a number of unusual art projects however a recent project by artist Diemut Strebe is perhaps the most unusual to date. A physical manifestation of Theseus’ paradox, wherein the ancient Greek hero was asked if a ship would remain the same if all its individual parts were replaced with new ones. The artist asks if a 3D Printed clone of Van Gogh’s ear could in fact be considered the same as the ear he infamous hacked off two years before his death while in the midst of a psychotic episode. The artist not content with creating a 3D model of Van Gough’s ear instead combined art and science to produce a living ear formed with van Gogh’s DNA. Strebe found a modern day descendent of van Gogh, the great-great grandson of this brother Theo. The descendent Lieuwe van Gogh shares a Y-chromosome and one sixteenth of Vincent van Gogh’s genome. The mould, produced in a dis-solvable sugar-polymer scaffolding was then filled with cartilage cells injected with Lieuwes’ DNA and placed inside a bio-reactor for several weeks where the cells grew as the scaffolding dissolved. Technically alive, the ear is now suspended in a nourishing liquid which is thought will keep the ear alive for a number of years. Visitors to the exhibition at the ZKM| Media Museum in Germany will be able to not only view the ear but also speak to it through a microphone that converts the input sound to simulate nerve impulses in real time.